Sometimes, you just need to have some nerdy English teacher fun. Make your students groan, roll their eyes, and maybe even smirk with this collection of 34 different puns presented on three separate “Tearable Pun” fliers. 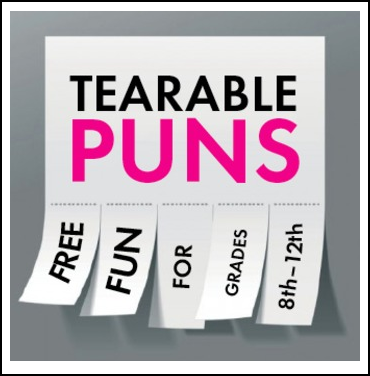 Post them in your room as a Friday treat or make a bunch of copies on colored paper and send your students around campus to commit Random Acts of Punning. Perhaps even covertly leave one in the teachers' lounge to spread some pun-love? These puns also work great as a supplement to any study of Shakespeare, the most pun-tastic of all writers. Common Core aligned? Um...not really. Lots of fun? Heck, yeah!